This trip will give you the opportunity to discover the best Mongolian highlights in only 6 days. Start with the visit of the Hustai National Park to meet with the famous Takhi, also called Przewalski, the last wild horse species in the world. It has been reintroduced in the wild in Hustai in the 90’s. Continue your way towards Orkhon and stop in Genghis Khan’s famous capital Kara Khorum. There you will visit the Erdene Zuu Monastery and its local museum. Then pursue your trip to the Orkhon Valley and stop at the beautiful Orkhon River Waterfall. Enjoy taking photo or, if you feel adventurous, climb down to the waterfall basin. Later, hike to the Tovkhon Monastery and visit this exceptional Buddhist area. Finally, end your trip on the shore of relaxing Lake Ugii where you can go for a hike or horse riding. Every night, we will set up our tents in beautiful places bringing you closer to nature and nomadic culture. Join us on this trip to explore untouched landscapes, natural wonders, legendary monasteries, historical ancient cities, grazing livestock and nomadic families. Day 1. Hustai National Park. Day 2. Kara Korum Ancient Capital. Day 5. Lake Ugii Nuur National Park. Day 6. Travel back to Ulaanbaatar. 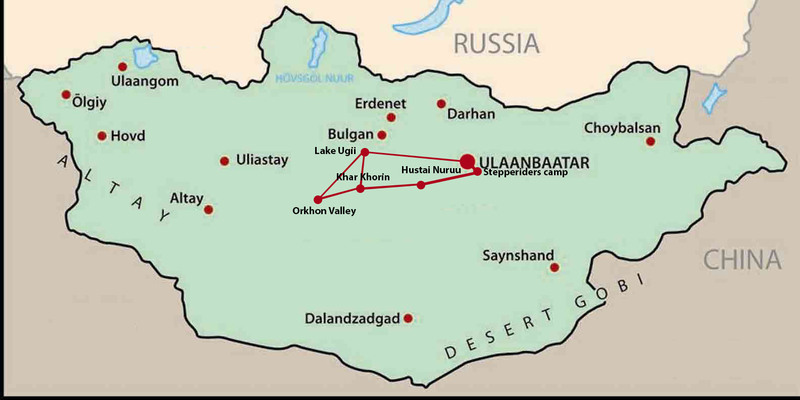 In the morning, we will start our journey from Stepperiders camp to Hustai national park, land of reintroduction of the Mongolia wild horses Takhi. We will visit the park and see the wild horses and other wildlife such as the red deer. In the evening, we will be transferred to our camping place. We travel to Kara Korum city which was the ancient capital of Mongolia Empire. Visit the legendary Erdene Zuu monastery and local museum. Transfer to Orkhon river side for camping. Stay overnight in tents B+L+D. In the morning, we will travel through the beautiful Orkhon Valley National Park, UNESCO’s culture heritage site, to reach the waterfall. This 24m high waterfall is one of the highlights of the Orkhon Valley. This place is also the home of many nomadic families and grazing yaks and other animals. We will hike around to lava stone gorges of the Orkhon River. Today we will travel to the Khangai mountain national park. Once at the mountain, we will hike or horse ride up to Tovkhon Buddhist monastery located on the top of the mountain scenery. This Monastery is related to Zanabazar the first Mongolian Buddha. We will visit the temple and its restored sites and hear the story of Mongolian Buddhism. Hiking to down and transfer to camping place. B+L+D. In the morning, we will travel to lake Ugii, a wonderful place for bird life and also renowned for fishing. We can do some hiking or horse riding trek. Stay overnight at shore of like. B+L+D. Today we will travel back to Ulaanbaatar city. We will take some short breaks to enjoy from different terrains and landscape. In the evening, you are transferred to your accommodation. B+L.